Domain Home is the ideal choice for you and your clients because we cater to stylish women and men who want exclusive looks they won’t find anywhere else, much like your clients. Domain Home offers the convenience of many accessible locations, and provides you the opportunity to work with your clients in a fully accessorized environment. Our newest showrooms also feature Britain’s legendary Aga cookers and ranges, complete with dazzling kitchen furnishings that are exclusive to Domain Home. Best of all, almost everything you will find at Domain Home is ready to deliver, and while we feature exclusive decorator looks, Domain Home is always affordably priced. Please complete the information below. 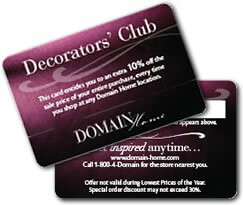 Upon approval, your Decorator Club card will be mailed to the address provided below within two weeks. With your card, you are entitled to an additional discount off the sale price of all purchases made at any Domain Home location. This card is non-transferable. Offer not valid during ‘Lowest Prices’ promotion period. Discount may not exceed 30% off on special orders. Domain Home collects personal information to improve its customer service and provide exclusive offers to its more than 45,000 enrolled Preferred Customers. Domain Home has a strict policy that prohibits release of any customer information to any third parties. We strictly enforce this policy because Domain Home values its trusted relationship with its customers as its most valued asset. As a part of our commitment to your privacy, Domain Home adheres to the guidelines and practices adopted by the Direct Marketing Association's "Privacy Promise to American Consumers." We agree (1) to honor customers' requests not to share their information with other marketers; and (2) honor customers' requests not to receive mail, telephone or other solicitations from Domain Home; (3) all emails have easy to use unsubscribe links.